Recently we heard about a restaurant in this area that serves very good typical local cuisine. Buca di Baldabo restaurant is in the village of Vico Pancellorum. We often ask for suggestions for places to visit and restaurants to go to in the area as we don’t want to leave here without trying as much as we can possibly fit in to 4 weeks. Yes, only 4 weeks. So much to see and so much to do. It will be impossible to see it all. So, yesterday in our little Fiat 500 we drove up to the village of Vico Pancellorum. 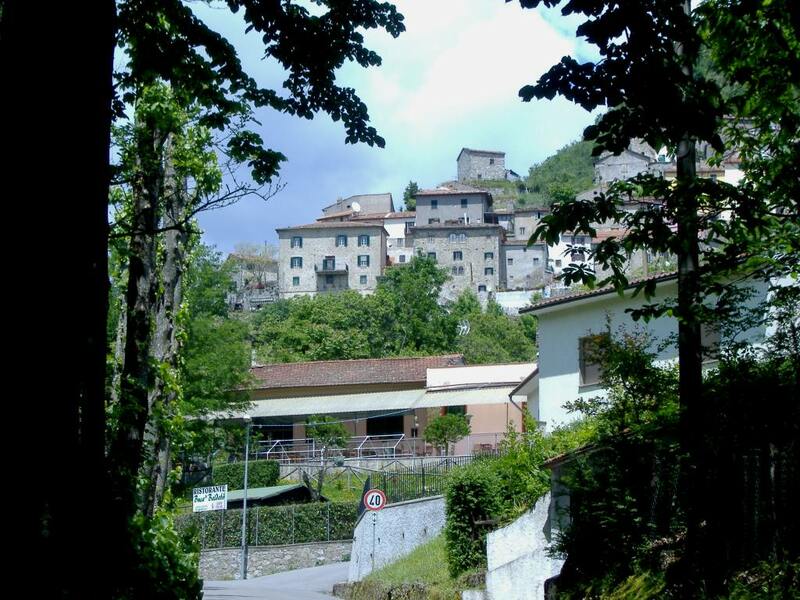 It is about a 15 minute drive north from here in Ponte di Serraglio before you turn off the main road and then drive up the mountain for about 2 kilometres. After several stops to take photos we finally found the restaurant. The owner was sitting in the front so in we wandered to have lunch only to learn that the restaurant is only open for lunch on Saturday and Sunday. Dam, does that mean that we must drive up to this gorgeous area again tomorrow. O well, if we must. So, today, I drove up alone. My friends are busy and I could not think of anything I would rather do than have lunch at this restaurant. I enjoyed a few detours along the way and discovered another lovely little village, Limano. The weather was very cold in Limano as I was quite high up. I don’t usually feel the cold, but Limano was freezing. The menu offered several different typical local dishes making it difficult for me to decide. But, I did decide. I chose Spinach and ricotta ravioli with sage and butter sauce for primi or first course and then cinghiale (wild boar) stew and asparagus for 2nd course. The ravioli and the cinghiale were cooked perfectly and absolutely delicious. The asparagus was over cooked for me as I prefer it still slightly crisp. I enjoyed some delicious local white wine with my lunch and of course the nice bread that also comes with it. Just before arriving to the restaurant there is a church from the medieval ages (which was built in the 9th century). The village consists of lovely little houses, a small piazza, narrow little roads, lots of gorgeous flowering plants, vines growing and stunning views. Do you ask, “Was the drive up to the village a 2nd time worth it?” Absolutely!!!! What fabulous pictures and so worth the drive a second time, yeah! What a beautiful place. Thanks for letting us tag along! This was well worth a second visit. I have a friend who has a family house there. I’ve always wanted to go and try the restaurant-maybe next time..